We all want to breathe clean air, drink safe water, and to be able to provide sustenance and a healthy, dignified life for our families. Human survival and well-being rests on a biodiverse and healthy environment and a safe climate. Environmental human rights defenders help us to achieve that – they defend the planet and their communities from the impact of harmful resource extraction or pollution by unscrupulous companies or governments. Their work is essential to attaining the sustainable development goals and ensuring that no-one is left behind. The draft resolution on environmental human rights defenders has now been formally ‘tabled’ at the Human Rights Council, meaning it is scheduled for consideration and adoption by the Council on 22 and 23 March. The draft resolution is a timely and important statement on the vital role of environmental human rights defenders in safeguarding biodiversity, addressing climate change, achieving sustainable development and promoting and protecting all human rights. · include specific calls on investors and development finance institutions to use their influence to better protect environmental human rights defenders. 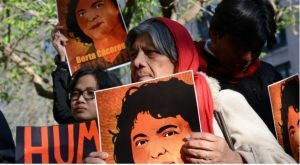 As the negotiations at the Human Rights Council enter their final phase, ISHR calls on all States and civil society to continue to push for the inclusion of key civil society asks, and to use the remaining days to work towards the adoption of a strong resolution on environmental human rights defenders. The resolution, as currently drafted, is an important step but does not yet represent the unequivocal signal in support of environmental activists the Council should send. Civil society* from across the world are calling on all UN Member States to demonstrate their support to environmental human rights defenders. At its current 40th session, the Human Rights Council is discussing a draft resolution on environmental human rights defenders. This is a timely and important initiative as UN agencies, human rights organisations and the media have documented unprecedented killings and attacks against people defending land and the environment. Stresses that an open civic space, including respect for the rights to freedoms of expression, peaceful assembly and association and movement, as well as the right to participate in the conduct of government and public affairs, is vital to the protection of both a healthy and sustainable environment and environmental human rights defenders. The draft being negotiated in Geneva contains some of these essential elements, which must be defended, but also offers significant potential for strengthening. As negotiations enter the final stretch, our organisations urge States to actively support the development of a resolution which clearly recognises the vital contribution of environmental human rights defenders to sustainable development and the effective enjoyment of human rights and formulates concrete asks of the States, development finance institutions and companies with the power of safeguarding that contribution.